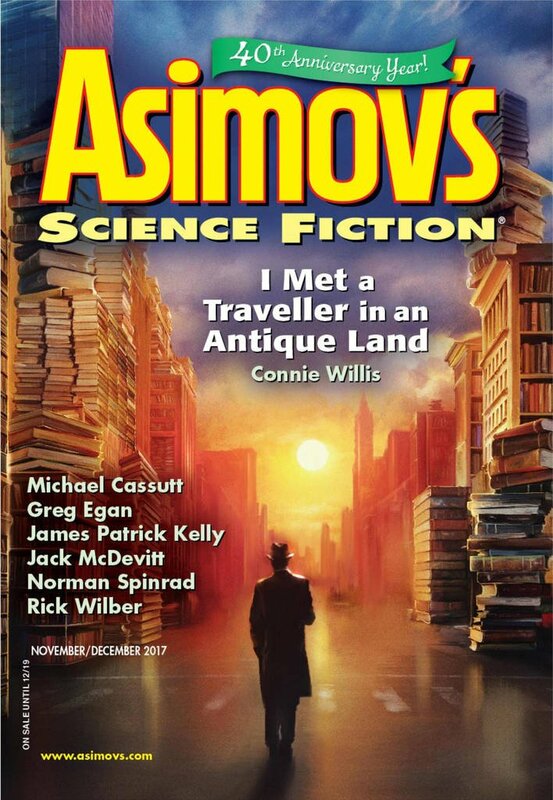 "The Discrete Charm of the Turing Machine," by Greg Egan [bio] (edited by Sheila Williams), appeared in Asimov's Science Fiction issue 11-12|17, published on October 19, 2017 by Penny Publications. Pro: Dan gets at least a short-term solution to his problem, and, more importantly, he finds a cause to work towards. It’s rather cute that someone is paying people for make work because they’d be too proud to accept charity. Dan and his wife have a believable relationship with each other and with their families, and it's touching how they support each other. Con: This is a “cardboard dystopia,” based on believing the Lump of Labor Fallacy and denying the Law of Comparative Advantage. The idea that progress is going to impoverish almost everyone by taking all the jobs is very old (~200 years old), it comes up over and over, and it’s always wrong. It's discouraging that the only answer Dan can find is to turn saboteur and start destroying technology. "Progress is the enemy" is an annoying message.